For as long as human beings could create texts (or even talk), certain groups of people have tried to control or restrict people’s access to such books, songs, speeches and ideas. This is called censorship. 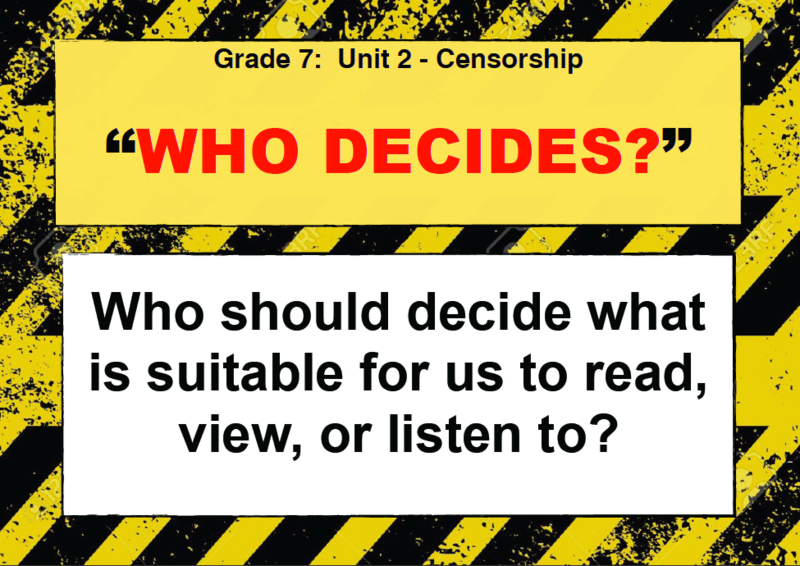 In this unit we will investigate why certain books have been censored or banned as well as learn about how censorship works in media texts. We will focus on opinionative and persuasive language, where we will work towards our own persuasive speeches and writing on a controversial text. We introduce the unit by exploring the concept of censorship and discussing some famous books that have been banned. We will then read a children’s story called Tango Makes Three and start to consider different perspectives on the censorship of the text. Last lesson we looked at censorship of books. Today, we look at the censorship of ideas through euphemistic word choices in a poem by Billy Collins called The History Teacher. Today we will look at how totalitarian regimes use censorship as a way to control ideas and people. We will read Luisa Valenzuela’s The Censors and use a ’cause and effect’ reading strategy to investigate how someone might act living under a totalitarian regime. This excellent movie provides us the jumping off point into debate and persuasive speaking. We will debate the ethics of ‘protecting’ people from the harsh realities of the real world and then learn persuasive speaking techniques to present our own opinions on the matter. Now that we have written a practice persuasive speech, it is time to learn how to deliver it effectively to an audience! We will watch video examples and learn some practical techniques for public speaking. In the next series of lessons we will look at violence across multiple media and explore the connection with the topic of censorship. Today’s lesson is about looking at different viewpoints and learning how to hold an effective discussion. Today we explore the genre of comics / graphic novels and investigate how violence is represented in a variety of different stories. We will explore the ‘visual language’ of comics and present our own opinions about violence in comics. The media is full of explicit images. Stories about violence, crime and drugs are common in daily news reporting, so today we look into how such reports are constructed and consider the effects of sensationalist news. Compared to other media, video games are a relatively new medium and thus have come under intense scrutiny for portrayals of violence, drug use, and other explicit content. But are these representations actually harmful? Today we also examine the electronic software age-classification process. Our final assessment is a persuasive speech where you share your perspective on a controversial censorship issue. We will learn to find a topic that matters, create a thesis, break down a topic into ‘parts’, write, and finally practise and perform a speech! In this final lesson we reflect on our learning throughout the unit, summarise our independent reading novels, and make conclusions in a blog post.